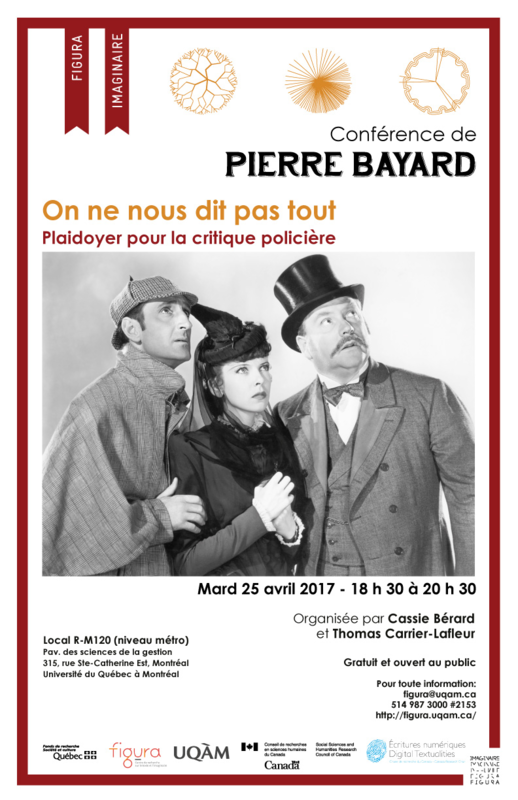 Pierre Bayard is professor of French Literature at the University Of Paris VIII and psychoanalyst. He is known for his essays which revisit the paradoxes, the pitfalls of literature, its unsuspected possibles and to rely on rash methods of reading to restore truth hidden under the layers of fiction. His works, accessible and playful, reach a wide audience. The scope of its study objects belongs to both the genre of the traditional detective novel (Conan Doyle, Christie) and classics of literature (Shakespeare, Balzac, Laclos, Proust, etc.). Pierre Bayard chose to discover how the writers imitated their successors, how the characters influence the reality, or how universe of fiction open up worlds to invest. The variety of subjects he reflected, the unusual angle by which he approached them made his approach unique, for many, suspicious, and in this, particularly conducive to open the discussion and lead the debates. Organized by Cassie Berard and Thomas Carrier-Lafleur , in collaboration with the Fond de recherche Société et culture du Québec, Figura, UQÀM, the Social Sciences and Humanities Research Council Of Canada and the Canada Research Chair on Digital Textualities. phone 514 987 3000, ext. 2153, or visit Figura's website.